This dish has it all…crunchy veggies, savory protein, satisfying noodles, and a flavorful sauce which provides exceptional flavor. Of course, there’s the fun factor, too: Roll it all up in a big lettuce leaf and grab a napkin. A thin, vermicelli rice noodle is traditional in this type of recipe. Sometimes, I mix it up with a curly, brown rice fusilli. n large skillet, brown beef and onion over medium-high heat. Stir in noodles, carrots, cucumbers, pepper, and mint. Cook until heated through but vegetables are still crisp. Combine lime juice, soy sauce, and sugar in a small bowl and pour over beef mixture. Mix well. 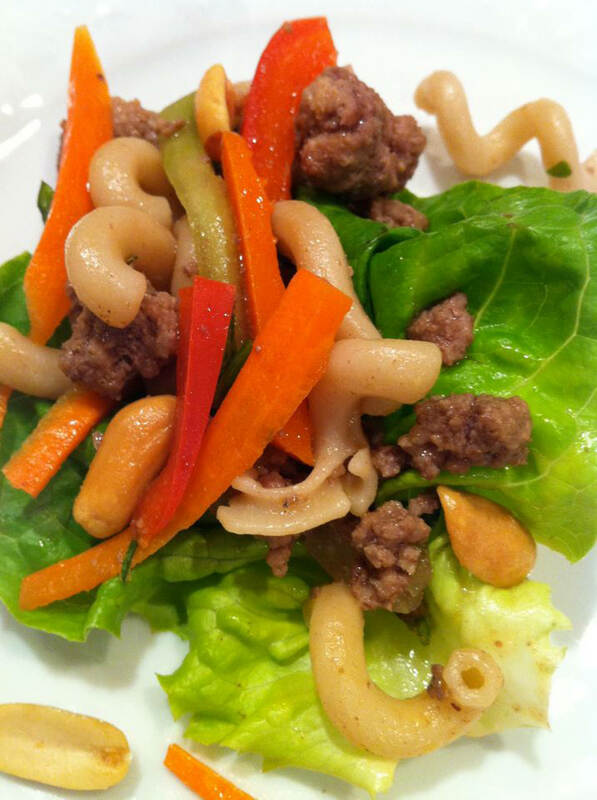 Sprinkle with chopped peanuts and spoon onto lettuce leaves.